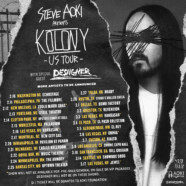 Steve Aoki has announced his North American tour dates for the ‘Kolony Tour,’ with Brooklyn born rapper and producer, Desiigner. The 32-city run kicks off February 10th in Washington D.C. and wraps March 17th in La Vegas, Nevada. Complete tour routing can be found below. Desiigner, Bed-Stuy native, rose to fame in 2016 after the release of his debut single “Panda,” which reached number #1 on the U.S. Billboard Hot 100. He since signed to Kanye West’s G.O.O.D. music label. This is the not the first run of an Aoki/Desiigner union. Aoki’s remix of BTS’ “Mic Drop,” featured Desiigner and debuted at #1 in 43 countries. The remix went on to solidify BTS as the highest charting K-Pop Group on Billboard Hot 100, as mentioned in Forbes Online. Aoki’s latest album, Kolony, debuted at #1 on the Electronic Album charts. Marking his first full turn into rap music Kolony is stacked with features including Lil Yachty, Migos, 2 Chainz, Gucci Mane, T Pain, and more. His latest single, “All Night” with Fifth Harmony’s Lauren Jauregui debuted at #1 iTunes Dance in over 30 countries and #1 iTunes overall in more than 14 countries. Tickets for the Kolony Tour will be available for pre-sale to the AOKIFAM fan club members starting on the 8th of December and the on-sale to the general public will be on the 12th. There will also be VIP packages available for this tour, giving the AOKIFAM access to perks such as VIP early entry to the venue, a pre-show meet and greet, exclusive tour merch and more — one of the packages even includes getting caked on stage, by Steve himself. Desiigner will not be in attendance on * marked dates and VIP/pre-sale will not be available.